"Jesus entered a village where a woman whose name was Martha welcomed him . 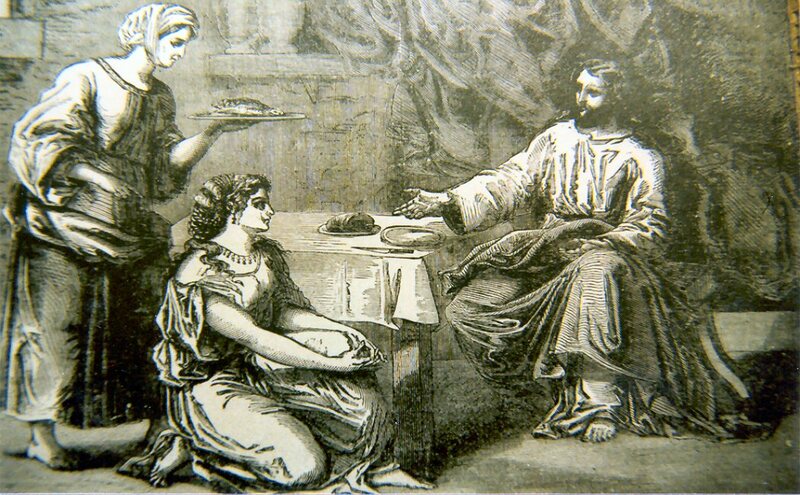 . . Martha was busy with all of the details of hospitality" (Lk 10). Two of today's scripture readings speak of hospitality, the reading from Genesis describes how Abraham and Sarah were exceedingly generous in welcoming and providing food and rest for their three strangers. It seems that being hospitable was an important aspect of middle eastern culture. Abraham considered it to be a social requirement, on greeting the strangers Abraham said: "Sir, if I may ask you this favor, please do not go on past your servant" (Gen 18). that was tantamount to saying: "You will do me a favor by allowing me to serve you". St. Luke's Gospel records how Martha "welcomed (Jesus)" to her home and got busy "with all of the requirements of hospitality" (Lk 10). Webster's dictionary defines 'Hospitality' as "Receiving and entertaining guests generously and kindly" (op. cit). I must admit that there have been times, when reading Luke's Gospel passage, I have thought that Martha got a "Bum rap". But then I thought that it was not characteristic of Jesus to demean his friends. "So what", I asked myself, "What was Jesus' intent?" A possibility which came to mind was: Jesus did not tell Martha that her work was wrong, or not needed. You know better than I that in welcoming guests to your homes there are many details to be worked-out. So, in all probability you can easily identify with Martha's petulance towards her sister, Mary. After all, had Martha not been busy in the kitchen Jesus would not have had anything to eat! It seemed to me, then, that being present to Jesus was the "Better part" that Mary had chosen, whereas Martha had allowed the very necessary details of hospitality distract her from Jesus' presence. Perhaps there is a lesson to be learned here. Eating is a necessity of life. Eating, however, is not just a function to be performed. Meal time has an important social dimension. Supper-time is a time for families to be "present" to one-another. I realize - and respect - that you all lead very busy lives. There is, however, a spiritual maxim which states that: "Grace builds upon nature". If we allow our personal integration to be compromised - be it by work, improper nourishment or fatigue - it will be more difficult to practice and to cultivate in ourselves and in children the psychic and spiritual dimensions of life. We cannot run away from the responsibilities and activities of life - that's for sure - but can we afford to not center our lives on those relationships which make life worth living"? If hospitality is essentially an act of charity - i.e., love of God and neighbor - let us not forget the adage: "Charity begins at home".